Thirty-plus years of collecting comics, with 17 near-capacity longboxes and counting, means there are some holes in my memory as to what I own and what I’ve read (two different things). As a result, a glaring omission was made in my recent post, A Fistful of Comic Book Annuals. 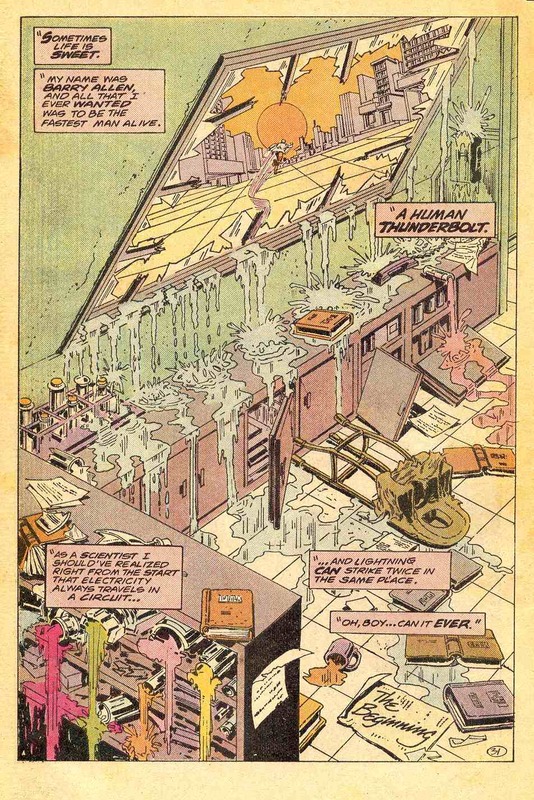 Not only did I leave off one of my top 5 comic book annuals, I actually left off the one I would put at number 2—Secret Origins Annual #2, from 1987 (no surprise there). This second annual looks at the origins of the two most famous scarlet speedsters—Barry Allen and Wally West. 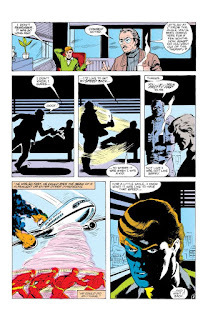 First, readers get to sit in on Wally West’s hour with his therapist, as he works to rediscover the speed he has lost since taking on the mantel of the Flash. 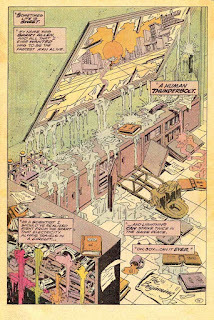 Over the course of the story, written by then-regular Flash scribe, William Messner-Loebs, with art from Mike Collins, Wally shares his origin along with many of the highlights of his superhero career. His therapist laughs at much of it, at the ridiculousness of some of the scenarios, and then asks the most important question—does Wally feel as if he’s unable to live up to Barry’s ideal, made more overwhelming with his death? In a telling scene, the therapist asks Wally to tally up the number of people he’s saved in the course of the past year, and Wally comes up with a total of hundreds. And yet, he feels as if he’s not doing enough, that Barry would be disappointed. Meanwhile, the therapist discusses the one time he saved someone from drowning, how the glow of that act stayed with him for weeks, and feels that, maybe, Wally should allow that the people he has saved might think differently about his ability as a superhero. 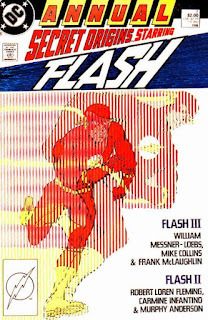 This desire, on Wally’s part, to get back the speed he’s lost, to be better, to live up to Barry’s memory, something impossible for anyone to achieve, became the thematic spine of the main Flash series for years afterward, propelling the narratives, and Wally’s characterization, forward, and making him, in my (and many others’) opinion, the best Flash DC comics ever had. And the idea that did the most to propagate that reality was born here. In the second half of this annual, we get the origin of Barry Allen, the second Flash and predecessor to Wally. 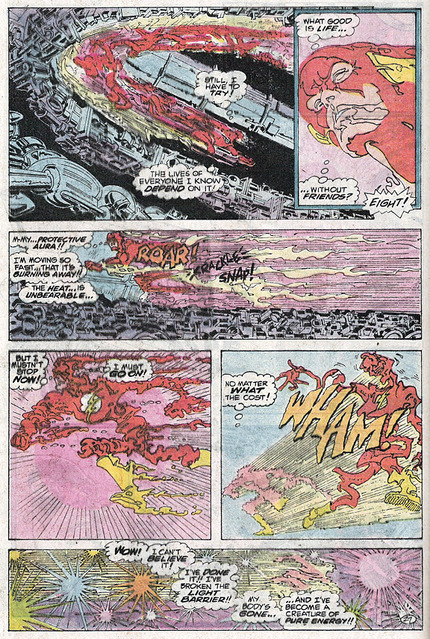 More vibrant in death—Barry’s sacrifice in issue 8 of Crisis on Infinite Earths, as he ran faster than he’d ever run, in order to destroy the Anti-Monitor’s cannon—this origin, from writer Robert Loren Fleming and classic Flash artist, Carmine Infantino, with inks by Murphy Anderson, offers little in the way of “secrets.” Much of Flash’s life from his long-lived series was well-known, and there were relatively few nuggets for Fleming to unearth. But the story hums along nicely, aided masterfully by Infantino’s elastic, flowing linework that epitomizes, for me, the Flash (no comic artist has ever done super-speed as well as Infantino). 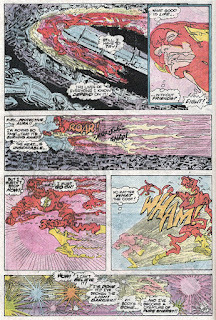 Until the end, as readers watch Flash race against the Anti-Monitor’s cannon again, the combination of anti-matter and insane speeds reached by Barry sending him, or an astral image, back through time, touching, again, on many of the important scenes from his life. And then, as he approaches that fateful day when lightning struck Barry and showered him in the chemicals that made him the Flash, he discovers that, all along, he was that lightning bolt, propelled back in time by his sacrifice. And, once more, the Flash was off and running to battle the bad guys of Central City.